Looking for affordable, hands-on cooking classes in Singapore? JOIN US FOR A COOKING CLASS OR FOR TEAM BUILDING! JOIN US FOR OUR NEXT FOODIES TOUR! 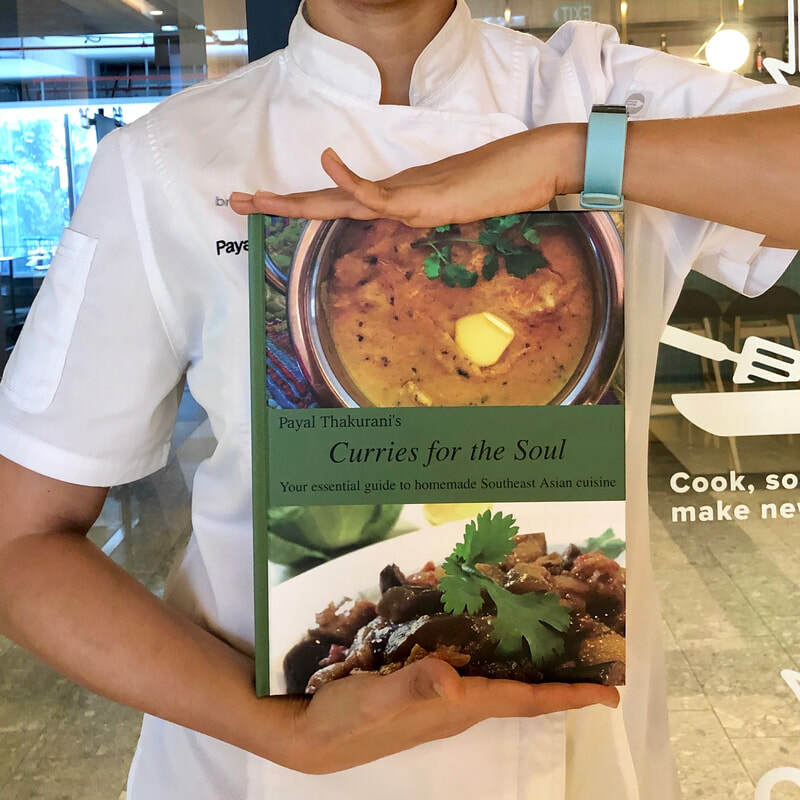 Payal is a passionate chef of Asian cuisine, and worked as an independent cooking instructor and as chef for an online supermarket in Shanghai. She now lives in Singapore and runs cooking classes to promote healthy Asian and Southeast Asian cooking. This book contains over 100 tried and tested recipes from Payal's kitchen. These include recipes that she grew up with, and many more that she learnt during her travels in Asia. It contains popular Indian and Thai classics like Butter Chicken, Tikka Masala, Jalfrezi, Papaya Salad, and Pineapple Fried Rice, to mention a few. I would like to thank you for the awesome food and the professional handling of everything. The food was really delicious; thumbs up from my side and my party guests. You have really made a positive impact on my family and in my life. What you taught me about balancing Thai food: salty, sweet, sour, and spicy continues to pay dividends and has allowed me to cook with more confidence. We had a great day and are still talking about the recipes. There was a really nice bunch of people that day. You're a lovely lady, and I'm privileged to have known you, wishing you lots of success in your career. I hope we see you on TV with your own cookery programme some day! Thank you so much for catering for our daughter's party. Everything exceeded my expectations far beyond. We all loved the food and the presentation was beautiful also. I will definitely be using your lovely food again. We were blown away by the food. Everyone loved it. Thank you for being so professional and lovely. Payal, Thanks so much for sending the recipes and for such a fun day! Both my sister and I had such a great time and sure loved the company and the food!!! I really love the ‘no pressure’ atmosphere and the easy going fun time!! You are awesome!